Mosquitos are annoying, plentiful, and at times, dangerous. Whether you’re on a camping trip in a Canadian national park or walking to school in Dar es Salaam Tanzania, mosquitos are an irritating and potentially fatal part of our lives. Malaria, Zika, Dengue Fever, and West Nile are a few examples of mosquito-vector pathogens responsible for high rates of morbidity and mortality. Due to our changing climate, mosquitos are now expanding to new areas and thus new control and prevention efforts are needed. Current mosquito repellent and control measures are either toxic depending on the DEET concentration, ineffective with short duration of protection, or time-consuming and cumbersome to apply. Luckily, Kite offers two novel mosquito repellant options. They currently have 1 product on store shelves and another in the later stages of development and testing. Kite Shield Repellent is a patent pending, DEET-free aerosol that is made from botanical active ingredients. The repellent provides approximately four hours of protection from the pesky insects. Expected to be released next year, the Kite Patch is developed as a lightweight, wearable sticker that has been shown to provide 48 hours of protection under lab conditions. Each year the Global Health Office at Dalhousie selects a theme to connect our discussions and events; this year we have chosen the Sustainable Development Goals established by the UN. This innovative product line highlights two of the UN Sustainable Development Goals: #4 Global Health and Wellbeing and #9 Industry, Innovation, Infrastructure. 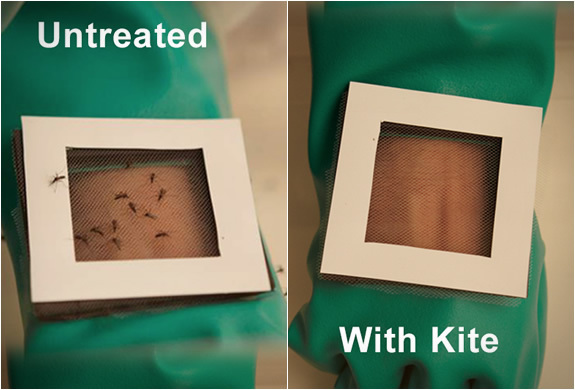 Kite’s goal of decreasing mosquito-born pathogens through essential medical product innovation is a creative next step towards reaching our UN sanctioned goals. Both products work by targeting the insects’ sense of smell. The powerful, non-toxic, easily applicable mosquito repellent patch targets the insect’s CO2 receptors, inhibiting their ability to locate their human target . Mosquitos can locate a person via exhaled CO2 from up to 100 yards away. The repellent products were developed at the University of California Riverside and financed through an individual donor financing campaign. To date, they have received six figures worth of funding from more than 10’000 backers that include the Bill and Malinda Gates Foundation and the American National Institute of Health. To test the Kite Patch’s effectiveness in the field, a large scale, 6-month pilot trial is currently underway in Uganda. Uganda is an East-African nation endemic to many mosquito-born pathogens including Malaria where in some areas, greater than 60% of children are infected. 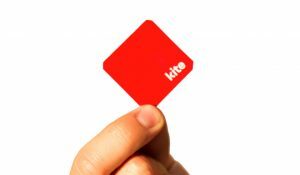 Kite is working with in-country organization Pilgrim Africa, who is helping distribute the repellent patches, implement the campaign infrastructure, and collect feedback on the technology. 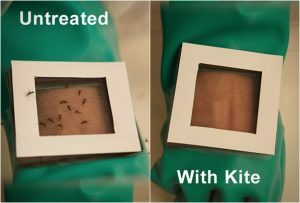 Kite is an exciting, creative new method of preventing mosquito born illnesses aimed at tackling the Global Health and Wellbeing and Industry, Innovation and Infrastructure objectives of the Sustainable Development Goals . With 2 million deaths per year from Malaria alone, new technology and control methods like Kite are needed to help prevent and control mosquito transmitted diseases. To find out more about the Sustainable Development Goals click here. To find out more about the Kite Patch click here. Rats don’t always have to be pests. An innovative NGO called Apopo, has recruited these rodents for humanitarian purposes. Giant African pouched rats (Cricetomys Gambianus), seen below, have been put through vigorous training to detect explosives such as landmines in addition to aiding in tuberculosis (TB) diagnosis using their keen sense of smell. Founded in 1998, by Belgian Bart Weetjenss, Apopo operates as a non-profit organization responsible for training detection rats in one of two programs: Mine Action and Tuberculosis Detection. Mine Action focuses on landmine and explosive removal while Tuberculosis Detection offers a second line option for TB diagnosis. Both programs have yielded impressive results thus far. This particular breed of rat, the Giant African Pouched Rat, was selected for Apopo’s programs because of their immunity to many tropical disease infections and is endemic to sub-Saharan Africa. The rats are bred in captivity, and the first stage of their training involves being handled by trainers at 5-6 weeks of age to become familiar with human interaction. The rat pups are trained through operant conditioning using a combination of click sounds and food rewards. Click training typically starts at 6 weeks of age so the rats associate the clicking sound with a food reward (usually banana or peanut). Once the rats have grasped the association of clicks with food, they are trained onto their target sent, TNT or TB depending which program they are allocated to. Their tasks become increasingly more difficult, finalizing in a blind accreditation test in order to graduate from their academy. Fortunately, very few of the rats fail to complete their training. If the rat is falling behind in their training schedule, it is not economically efficient to allocate additional training time. The unsuccessful rats are granted an early retirement, and are continually cared for on the Apopo sites. Currently, Apopo has 31 working rats in the TB Headquarters in Morogoro, Tanzania and 9 at the Maputo clinic in Mozambique. 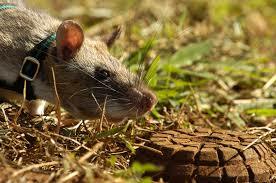 Angola has 42 operational landmine detection rats, and Mozambique has 20 respectively. With 47 rats still in various stages of training, we can expect to see the HeroRat workforce increase over the next few years. Despite being immune to most tropical diseases, the rats receive weekly veterinary checkups and regular preventative treatments for parasites. 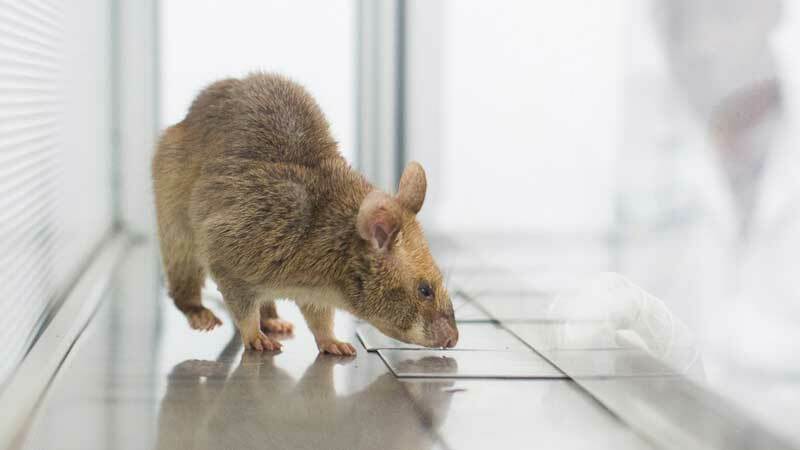 To date, no rats have been lost due to their detection work in either TB or mine detection, and the majority live to the end of their expected life span of 8 years. When it is noticed that the rats are not their typical enthusiastic selves about going to work anymore, they are awarded with retirement where they continue to receive weekly health checks and exercise. Apopo’s headquarters can be found in Morogoro Tanzania where the breeding and training facilities and primary TB detection clinic are located. Mine action centres are located in Mozambique Angola and the Southeast Asian nations Vietnam, Thailand, Cambodia and Laos DPR. They hope to expand to other nations, but the issue lies with funding. With the cost of training one rat at €6000.00, it is not an easy endeavor. Further logistics involve having to register as an NGO through the country’s government and once achieved, import necessary equipment, machines, trained rats and recruit local individuals to become staff. Stay tuned for more posts about the Mine Action and Tuberculosis Detection Programs! Below is a link of the founder Bart Weetjenss giving a TED talk about Apopo!